Have you been naughty or nice? 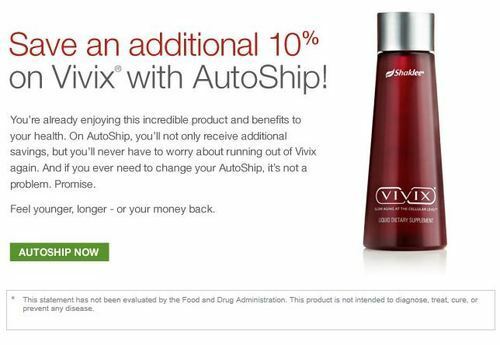 Would you like to find a bottle of Shaklee’s “Vivix” in your stocking this year? Give yourself a gift this year and put your monthly order on AutoShip to save 10%! This week, we’re seeing everything in both red and green. Happy Holidays! “It’s nearly Christmas. You’re either running around frantically doing your last minute shopping, or you’ve been finished for weeks and you’re serenely sipping an eggnog in front of your glowing Christmas tree. Count me in the former group. As we steam into the holiday, spare a thought for the environment. Human consumption is the single and only reason the planet is in trouble: the consumption and disposal of fuel and commercial goods. As we get busier and busier, it’s very tempting to take the easy route of having a largely disposable Christmas – paper gift wrap, gifts with massive packaging, buying too much food “just in case”. A little bit of forethought and planning, however, means you can be far more planet-friendly, which means you’ll enjoy the holiday with far less guilt. Hooray! – Consider the gifts you buy. Will the recipient love and use it, or are you simply buying for the sake of buying? If you’re stuck, a gift card might be a better option, as it means the recipient will select something they’ll truly love and use. Also consider where and how the gifts you’re buying are made; local and sustainable is always better. – Consider gift presentation. Gift wrap is easy to find for $0.99 at the drugstore, and will be used for about two days before it’s thrown away. A reusable gift bag is a much better idea. Or you could consider a much more beautiful, elegant idea such as using a reusable wrapping scarf like those found at Bobowraps. Your gifts will look fantastic and the scarves will last for years. – Consider food. Buy sustainable, local, organic wherever you can. When that isn’t possible or practical, try to look for the next best alternatives: less packaged, fresher foods are better for the planet and better for you. Also, don’t overbuy – having to throw out extra food at the end is incredibly wasteful. Try to repurpose your Christmas dinner leftovers – turkey sandwiches are always delicious, but there are loads of delicious recipe options for your leftovers. And don’t forget – almost everything in a traditional Christmas dinner freezes like a dream. Treat yourself to a fancy turkey dinner in mid January! – Consider those less fortunate. If the overconsumption of the holidays is getting you down, why not change your approach? Tell your friends and family that your gift to them is a warm, cozy visit with a mug of hot chocolate, and instead funnel your gift money in to a local homeless shelter or a charity helping international development. Your loved ones will appreciate the time, and you’ll appreciate doing some good for someone who needs it.